Sea Cargo - Compare International Shippers & Save up to 70% ! Cargo is a term used to denote goods or produce being transported generally for commercial gain. The cargo can be transported on a ship, plane, train or truck.Nowadays, containers are used in all intermodal long-haul cargo transport. A cargo ship is any sort of ship that carries cargo, goods, and other materials from one port to another. Cargo shipping via sea is generally considered one of the most economical methods of shipping. Sea cargo is usually packed in containers. When you use Intlmovers it will help you quickly and easily request quotes from muttiple international cargo shipping companies in one simple request. It will save you time and energy. You avoid the searching and chasing around because the movers respond directly to you and provide you with a quote that is specific to your international move. Sea Cargo can also be referred to as Sea freight. It is the transport of goods in sea containers that are dispatched through sea ports. Generally when you ship anything through sea freight your carrier will give you a bill of lading this should be anywhere from one week after the goods having departed from the harbor. You need to have this document as proof of shipping, carrier and cost. When you send anything through sea cargo it mainly is the responsibility of the owner of the goods to do the packing. 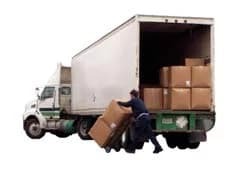 There are always additional services available if you prefer a professional to pack your goods and it is a good idea for valuable, heavy or fragile items. Check the liability or insurance of your carrier- Most sea carriers will only cover your goods for 5 USD per kilo if the ship should not make its destination or your goods are lost. You can purchase additional insurance for damage, just ask your carrier and he should be able to provide you with a quote. Make a good packing list and keep a copy for yourself. It’s required to have a packing list in case of loss you need a verified list to claim compensation for your valuables. If you choose to self pallet secure it, don’t take risks. You can cut your cost by self packing and palletizing, but be aware you take full responsibility for any loss due to damage from packing. Use professional grade straps to secure the load to the pallet then cover the entire pallet with muti- layers of plastic packing wrap. This also helps protect against any moisture that may enter the container. These supplies can be purchased by a local moving company, truck rental or online packing supplies retailer. When you make an overseas move, you can use an aeroplane or cargo shipping to transport your cargo. Our international movers have the right contacts for an overseas move with cargo shipping They have the experience and contacts to make it a smooth and efficient way of shipping your goods.